Tremendous research has showed the vital role of tumor suppressor p53 at different stages of cancer development. As the central player to maintain cellular homeostasis, p53 regulates its target genes in response to various stimulations. Any change in p53 status could lead to undesired cell fate. Therefore, the fine tune control of p53 signaling is important and worth to explore. Even more, these factors as well as regulation steps could be useful point for developing therapeutic methods. As a subunit of nuclear pore complex (NPC), the nuclear porin protein NUP98 has an established role in regulating macromolecule trafficking and mRNA export, our recent study interestingly showed that NUP98 itself is involved in p53 signaling through post posttranscriptional regulation on selected p53 target genes most notably p21, and may function as a tumor suppressor in Hepatocellular carcinoma (HCC). Mechanistically NUP98 is associated with the 3’UTR of the p21 gene and thereby stabilizes p21 mRNA. The selectively expression of p21 directs the entry of cell cycle arrest instead of apoptosis. Thus, p21 and some other p53 target genes’ mRNA levels are associated with the expression of NUP98 have been identified in human HCC samples. Hepatocellular carcinoma (HCC) is the fifth most common cancer disease worldwide and the third most common cause of cancer death. HCC is most common in Asia and its prevalence is rapidly increasing in Western countries including US. Chronic infection with HBV is the leading cause of HCC. Although treatment options have improved in the past 30 years, prognosis remains dismal for many patients due to unclear molecular mechanisms of HBV-mediated HCC. The HBV genome contains four overlapping genes including X, P, S/preS, and C/preC. The X gene, encoding a 17 kDa protein named HBX, is the most frequently integrated viral gene found in HCC and is suggested to play a vital role in HBV-mediated HCC development. Interestingly, we discovered that HBX protein has a negative impact on NUP98, then regulates the expression of several HCC related genes, such as IGFBP3. To understand the link between the p53/NUP98 axis and HBX may provide a fundamental molecular mechanism to illuminate HCC pathogenesis. On the other hand, NUP98 chimeric mutants were often found in AML/CML due to the chromosomal translocation. NUP98-HOXA9 is the first NUP98 associated fusion protein has been identified from leukemia patient in 1996. AML, which is one of the major subtypes of leukemia, accounts for approximately 18% of childhood cancer diagnoses. As AML is a differentiation-defect disease, NUP98 fusion proteins likely inhibit hematopoietic differentiation. To elucidate how NUP98-HOXA9 contributes to the development and/or maintenance of leukemia stem cells (LSCs, the cell type capable of initiating and maintaining the leukemic clonal hierarchy) and how NUP98-HOXA9 is involved in dysregulation of p53, engineered NUP98-HOXA9 human ES lines are proposed. The NUP98-HOXA9 fusion has been endogenously expressed in human ESCs by CRISPR/Cas9 genome editing, differentiate the cells to hematopoietic lineages and study their pathological alterations and potential tumorigenic potential. Since current cancer cell lines are only isolated after many steps of tumor evolution these lines are not optimal for studying the biological function of chromosomal translocations during tumor development and progression of NUP98-HOXA9 in AML. The NUP98-HOXA9 hESC model not only can be used for studying NUP98-HOXA9-associated AML, but will also advance information for other AMLs with NUP98 fusions such as NUP98-HOXA11, NUP98-HOXA13, NUP98-HOXC11, NUP98-HOXC13, NUP98-NSD1, and others. This model will provide a valuable resource for the leukemia scientific research community. Also, identification of an LSC population in NUP98-HOXA9-associated AML could enable future therapies for AML patients. Lee DF, Su J, Kim HS, Chang B, Papatsenko D, Zhao R, Yuan Y, Gingold J, Xia W, Darr H, Mirzayans R, Hung MC, Schaniel C, Lemischka IR. (2015). Modeling familial cancer with induced pluripotent stem cells. Cell. Apr 9;161(2):240-54. doi: 10.1016/j.cell.2015.02.045. Chen J, Shin JH, Zhao R, Phan L, Wang H, Xue Y, Post SM, Ho Choi H, Chen JS, Wang E, Zhou Z, Tseng C, Gully C, Velazquez-Torres G, Fuentes-Mattei E, Yeung G, Qiao Y, Chou PC, Su CH, Hsieh YC, Hsu SL, Ohshiro K, Shaikenov T, Wang H, Yeung SC, Lee MH. (2014). CSN6 drives carcinogenesis by positively regulating Myc stability. Nat Commun. Nov 14;5:5384. doi: 10.1038/ncomms6384. PMID: 25395170. Fuentes-Mattei E, Velazquez-Torres G, Phan L, Zhang F, Chou PC, Shin JH, Choi HH, Chen JS, Zhao R, Chen J, Gully C, Carlock C, Qi Y, Zhang Y, Wu Y, Esteva FJ, Luo Y, McKeehan WL, Ensor J, Hortobagyi GN, Pusztai L, Fraser Symmans W, Lee MH, Yeung SC. (2014). Effects of obesity on transcriptomic changes and cancer hallmarks in estrogen receptor-positive breast cancer. J Natl Cancer Inst. Jun 23;106(7). pii: dju158. doi: 10.1093/jnci/dju158. Print 2014 Jul. PMID: 24957076. Zhao R, Yang HY, Shin J, Phan L, Fang L, Che TF, Su CH, Yeung SC, Lee MH. (2013). CDK inhibitor p57 (Kip2) is downregulated by Akt during HER2-mediated tumorigenicity. Cell Cycle. Mar 15;12(6):935-43. doi: 10.4161/cc.23883. Epub 2013 Feb 19. PMID: 23421998. Singer S, Zhao R, Barsotti AM, Ouwehand A, Fazollahi M, Coutavas E, Breuhahn K, Neumann O, Longerich T, Pusterla T, Powers MA, Giles KM, Leedman PJ, Hess J, Grunwald D, Bussemaker HJ, Singer RH, Schirmacher P, Prives C. (2012). Nuclear Pore Component Nup98 Is a Potential Tumor Suppressor and Regulates Posttranscriptional Expression of Select p53 Target Genes. Mol Cell. Dec 14;48(5):799-810. doi: 10.1016/j.molcel.2012.09.020. Epub 2012 Oct 24. PMCID: PMC3525737. Chen B, Zhao R, Su CH, Linan M, Tseng C, Phan L, Fang L, Yang HY, Yang H, Wang W, Xu X, Jiang N, Cai S, Jin F, Yeung SC, Lee MH. (2012). CDK inhibitor p57 (Kip2) is negatively regulated by COP9 signalosome subunit 6. Cell Cycle. Dec 15;11(24):4633-41. doi: 10.4161/cc.22887. Epub 2012 Nov 27. PMID: 23187808. Xue Y, Chen J, Choi HH, Phan L, Chou PC, Zhao R, Yang H, Santiago J, Liu M, Yeung GE, Yeung SC, Lee MH. (2012). HER2-Akt signaling in regulating COP9 signalsome subunit 6 and p53. Cell Cycle. Nov 15;11(22):4181-90. doi: 10.4161/cc.22413. Epub 2012 Oct 24. PMCID: PMC3524214. Lee DF, Su J, Ang YS, Carvajal-Vergara X, Mulero-Navarro S, Pereira CF, Gingold J, Wang HL, Zhao R, Sevilla A, Darr H, Williamson AJ, Chang B, Niu X, Aguilo F, Flores ER, Sher YP, Hung MC, Whetton AD, Gelb BD, Moore KA, Snoeck HW, Ma’ayan A, Schaniel C, Lemischka IR. (2012). Regulation of embryonic and induced pluripotency by aurora kinase-p53 signaling. Cell Stem Cell. Aug 3;11(2):179-94. doi: 10.1016/j.stem.2012.05.020. Qu C, Liang Z, Huang J, Zhao R, Su C, Wang S, Wang X, Zhang R, Lee MH, Yang H. (2012). MiR-205 determines the radioresistance of human nasopharyngeal carcinoma by directly targeting PTEN. Cell Cycle, Feb 15; 11(4):785-96. PMCID: 22374676. Ling J, Kang Y, Zhao R, Xia Q, Lee DF, Chang Z, Li J, Peng B, Fleming JB, Wang H, Liu J, Lemischka IR, Hung MC, Chiao PJ. (2012). KrasG12D-induced IKK2/β/NF-κB activation by IL-1α and p62 feedforward loops is required for development of pancreatic ductal adenocarcinoma. Cancer Cell. Jan 17;21(1):105-20. PMCID: 22264792. Lee MH, Zhao R, Phan L, Yeung SC. (2011). Roles of COP9 signalosome in cancer. Cell Cycle. Sep 15;10(18):3057-66. Epub 2011 Sep 15. Review. PMCID: 21876386. Choi HH, Gully C, Su CH, Velazquez-Torres G, Chou PC, Tseng C, Zhao R, Phan L, Shaiken T, Chen J, Yeung SC, Lee MH. (2011). COP9 signalosome subunit 6 stabilizes COP1, which functions as an E3 ubiquitin ligase for 14-3-3σ. Oncogene. Dec 1;30(48):4791-801. doi: 10.1038/onc.2011.192. Epub 2011 May 30. PMCID: 21625211. Zhao R, Yeung SC, Chen J, Iwakuma T, Su CH, Chen B, Chen YT, Lin YL, Jin F, Zhang F, Zhu R, Shaikenov T, Sarbasov D, Sahin A, Wang HM, Lozano G, and Lee MH. (2011). Subunit 6 of the COP9 signalosome promotes tumorigenesis in mice through stabilization of MDM2 and is upregulated in human cancers. J Clinical Investigation, Mar 1;121(3):851-65. PMCID: 21317535. Su CH, Zhao R, Zhang F, Qu C, Chen B, Feng YH, Phan L, Chen J, Wang H, Wang HM, Yeung SC,and Lee MH. (2011). 14-3-3sigma exerts tumor-suppressor activity mediated by regulation of COP1 stability. Cancer Research, Feb 1; 71(3):884-94. PMCID: 21135113. Zhao R, Fuentes-Mattei E, Velazquez-Torres G, Su CH, Chen J, Lee MH and Yeung SC. (2011). Exenatide improves glucocorticoid-induced glucose intolerance in mice. Diabetes, Metab Syndr Obes. Jan 26;4:61-5. PMCID: 21448323. Su CH, Zhao R, Velazquez-Torres G, Chen J, Gully C, Yeung SC, and Lee MH. (2010). Nuclear export regulation of COP1 by 14-3-3s in response to DNA damage. Mol. Cancer, Sep 15; 9:243. PMCID: 20843328. J Chen, M Kobayashi, S Darmanin, Y Qiao, C Gully, Zhao R, B Teh, SC Yeung* and MH Lee*. (2009). Pim-1 plays a pivotal role in hypoxia-induced chemoresistance. Oncogene, Jul 16;28(28):2581-92. PMCID: 19483729. J Chen, M Kobayashi, S Darmanin, Y Qiao, C Gully, Zhao R, M Shindoh, S Kondo, S-C J Yeung*, and M-H Lee*. (2009). Hypoxia-mediated upregulation of Pim-1 contributes to solid tumor formation. Amer J Pathology, Jul;175(1):400-11. PMCID: 19528349. Pan J, Chen B, Su CH, Zhao R, Xu ZX, Sun L, Lee MH, Yeung SC. (2008). Autophagy induced by farnesyltransferase inhibitors in cancer cells. Cancer Biol Ther. Oct; 7(10):1679-84. Epub 2008 Oct 21. PMCID: 18769123. Yang , H., Zhao, R.*, Zhang, Y. *, Wen , Y. Y. *, Fournier , K., Wu, H.B., Yang, H. Y., Diaz, J., Laronga, C., and Lee, M. H. (2006). Negative cell cycle regulator 14-3-3 sigma stabilizes p27 Kip1 by inhibiting the activity of PKB/Akt. Oncogene, 25 (33):4585-94; Aug 3. (* These authors have equal contributions).PMCID: 16532026. 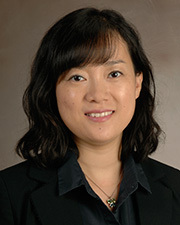 Yang, H., Yang, H., Zhao, R., and Lee, M. H. (2006). Modified p27 Kip1 is efficient in suppressing HER2-mediated tumorigenicity. J Cell Biochem. 98(1):128-38; May 1. PMCID: 16365885. Yang , H., Zhao, R.*, Wen , Y. Y. *, Lin, Y. L., Fournier , K., Yang, H.Y., Wu, H. B., Qiu, Y.Diaz, J., Laronga, C., and Lee, M. H. (2006). DNA damage-induced protein 14-3-3 sigma inhibits PKB/Akt activation and suppresses Akt-activated cancer. Cancer Res. 15; 66 (6):3096-105; Mar. (* These authors have equal contributions). PMCID: 16540659. Yang, H., Zhao, R., and Lee, M. H. (2006). 14-3-3sigma, a p53 regulator, suppresses tumor growth of nasopharyngeal carcinoma. Mol Cancer Therapeutics. 5 (2):253-60; Feb. PMCID: 16505098. Yang H, Zhao R, Yang HY, Lee MH. (2005). Constitutively active FOXO4 inhibits Akt activity, regulates p27 Kip1 stability, and suppresses HER2-mediated tumorigenicity. Oncogene. 24(11):1924-35; Mar 10. PMCID: 15688030.